We achieve successful results for our clients. 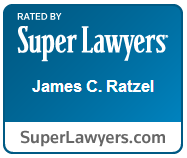 Jim Ratzel is a graduate of Hanover College in Hanover, Indiana and the University of Toledo College of Law. In college, Jim studied at the United Nations and served as a congressional intern in Washington, D.C. Following law school, Jim initially was appointed as an Administrative Law Judge for the Wisconsin Worker’s Compensation Division. After serving as judge Jim accepted an appointment as an Assistant United States Attorney with the United States Department of Justice. Over the next several years Jim successfully defended the United States and government employees in a variety of civil suits. Jim was commended by the Veterans Administration for his successful defense of a medical malpractice claim against the Veterans Administration and two of its doctors. Jim also successfully defended the United States Department of Commerce in a loan guaranty case that was the first trial of its kind in the country under a new policy of the Reagan Administration. Jim has successfully conducted over 100 trials in state and federal court and has argued before the Wisconsin Supreme Court and the United States Court of Appeals for the Seventh Circuit. He has been counsel in hundreds of workers compensation hearings. Jim’s practice is concentrated in insurance defense litigation. His clients range from small local businesses to Fortune 500 companies. Jim is one of the leading attorneys in the State on 102.29 recovery. Jim is a frequent speaker to various insurance groups and employers. He has been a part-time lecturer at a local university. In the past Jim has served on the Governor’s Council on Traffic Law Enforcement and was also the recipient of the U.S. Marshal’s Certificate of Distinguished Service. Jim previously served on the Board of Directors of the Civil Trial Counsel of Wisconsin and as Chairman of the CTCW Worker’s Compensation Committee. © 2019 Ratzel Pytlik & Pezze, LLC. All rights reserved.